Remote data monitoring is required in many industries and applications such as oil & gas, power, waste water treatment, and environmental monitoring. In these applications, a fairly large number of RTUs in remote and/or hazardous locations collect data from devices and send log data and alarms to a SCADA terminal in a central control room (CCR). Telemetry devices installed between the RTUs and the SCADA system send and receive the data. Some big concerns about using telemetry are cost (initial expenditure and communications fees) and communications stability. As the IT network infrastructure improves in remote areas, commodity network infrastructure can be more readily used in telemetry applications, reducing initial startup costs and affording relatively stable communications. Conventional telephone lines are billed per minute of connection time regardless of whether data is actually sent. On the other hand, when using the GPRS mobile data service on a Global System for Mobile Communications (GSM) system, billing is based on the number of communication packets and is independent of connection time. 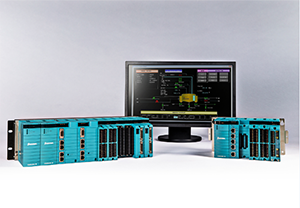 To make the most of the advantages of GPRS, Yokogawa's STARDOM FCN/FCJ intelligent RTUs and FAST/TOOLS SCADA package have several functions that reduce the number of packets that must be sent. This dramatically lowers communication fees while no concessions are made in response time (e.g. for alarming). In a recent project, this succeeded in reducing the number of packets by 80%. Note: Transfer rates of GPRS are theoretically up to 171.2kbps. However, transfer rates of between 30-50 kbps are common because they are depend on several factors such as distance to the base transfer station (BTS) and numbers of users in the same area. The amount of log data on an RTU would be huge if all data were stored. To reduce the amount of stored data, the FCN/FCJ logs only the data that has changed since the last time stamp. FAST/ TOOLS periodically monitors for changed data on the FCN/FCJ and acquires the log data only in situations such as when there is some change in the data, an alarm occurs, or the refresh button is pressed by the operator. When FAST/TOOLS reads the log data, it is timestamped and merged into its trend data buffer to ensure a seamless trend data graph, even if the network fails and needs to be recovered. The FCN/FCJ RTUs can connect to the GPRS/GSM networks provided by ISPs. Though the types of services vary according to country and region, ISPs typically perform internet protocol (IP) address assignment. An IP address is a unique address that is assigned to devices so that they can identify and communicate with each other on a network. There are two types of IP addresses: a static IP address, which is a unique and fixed IP address on a network, and a dynamic IP address, which is assigned by means of the Dynamic Host Configuration Protocol (DHCP) every time a device starts. An RTU and a SCADA send and receive data based on a statc IP address. A SCADA station acquires log data from an RTU by using static IP address. The use of a dynamic IP address is often necessary if an ISP does not provide a static IP address service or if the cost of a static IP address service is much higher than a dynamic IP, making the provision of a static IP to every RTU commercially unfeasible. In this case, the Dynamic Domain Name System (DDNS) is required to convert the host name to a dynamic IP address so that the RTUs and SCADA can communicate with each other using a fixed host name. Even if a local provider cannot provide DDNS service, FAST/TOOLS and the FCN/FCJ RTU can communicate with each other via a DDNS server that is located in the same computer room as the FAST/TOOLS system. The FCN/FCJ RTU autonomously sends its own host name and IP address to the DDNS server, which has a fixed IP address, and then the DDNS manages the FCN/FCJ RTU's host name and IP address. A SCADA station acquires log data from an RTU by using fixed host name. As you may already know, GSM cellular phone networks can be affected by weather conditions or electrical interference, and in the worst case, communications can be lost. In the same way, a GPRS link over a GSM network connecting a SCADA system to RTUs can be cut at any time. However, the FCN/FCJ RTUs can automatically reestablish the communications link if this occurs. The FCN/FCJ intelligent RTUs establish a connection with the GPRS network using an embedded PPP protocol. If the PPP communications link is lost, the FCN/FCJ RTUs monitor the PPP status and at regular intervals attempt to re-establish the connection with the GPRS network. With this function, the connection between FAST/TOOLS and the FCN/FCJ RTUs is guaranteed. This, combined with the system's capability to keep a log, ensures that data is never lost: FAST/TOOLS will automatically "catch-up" as soon as a communications link is reestablished. SCADA telemetry systems used in oil & gas, environment monitoring, and water distribution applications have to be capable of covering a wide area and functioning under harsh conditions, and must be at the same time affordable and inexpensive to operate. With its FAST/TOOL SCADA package and FCN/FCJ intelligent RTUs, Yokogawa is helping its customers improve cost competitiveness and improve quality.